Up to about jogging speed, (6 to 8 mph), power loss on a bike is for practical purposes about equal from mechanical, tire, and air drag. 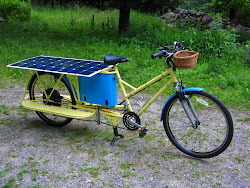 Above that speed air drag rapidly becomes dominant, and since I wish to travel quickly over a longer distance between towns, it becomes a main consideration for the design of the third solar cargo bike. Having a slippery shape (low Coefficient of drag), and a small frontal area (pushing less air around), are the most practical ways to reduce energy use, increase speed, and extend battery range in the forward direction, and increase stability and safety in crosswinds. I'm working through the compromises between a very efficient shape, and ease of use. If something is pushed along through the air and the air flows around it smoothly and leaves still air behind it, (imagine a canoe coasting through water), it uses much less energy than if the air flow is broken up and swirling air is left behind (imagine a barge with eddies behind it in the water). Still water in wake of a canoe, in laminar flow the water doesn't mix around. I'm going to ignore the Reynolds number concept here, because most bicycle aerodynamics are so lumpy, (like the turbulent example), that you are guaranteed to get eddies. We don't need to predict them, just to reduce them. I'm also going to assume this is for solo biking and ignore drafting. 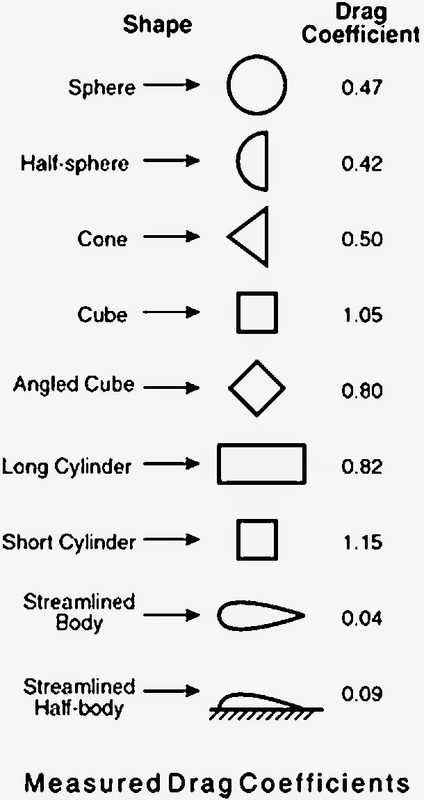 Drag Coefficients for various generic shapes. Air is flowing at them from the left. A smaller number is less drag. Notice the half sphere has less drag than the whole sphere. This approach has problems with weight, crosswinds, and street maneuverability. 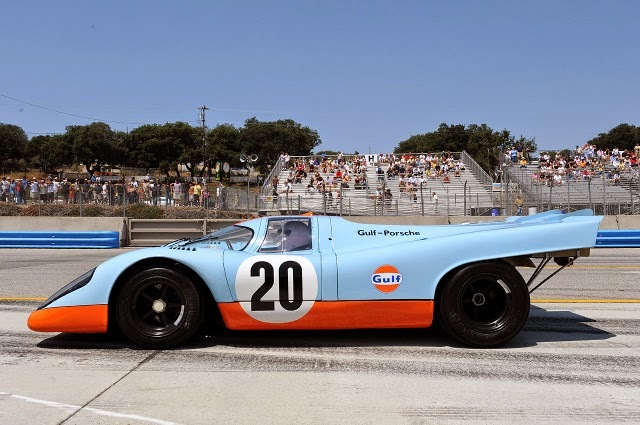 The 917K had more drag and a slower top speed than the longtail, but it illustrates a bodywork trend that was being applied to everyday cars starting about that time- the Kammback. If you can't have a long tapered tail, the next best thing is an abrupt cutoff. This is the rear trunk spoiler on modern cars (even minivans)- it doesn't actually push down for traction as much as it separates the air flow for reduced drag. Air flowing around a body will try to press in towards the surface of the decreasing second half, but if it can't fill the space completely then a vacuum forms. 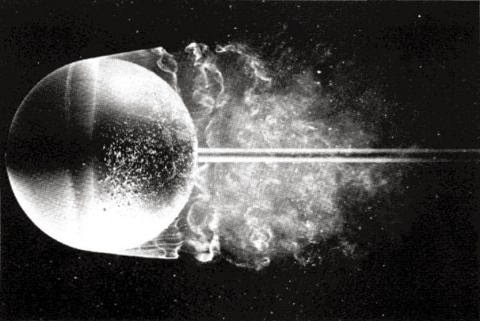 The vacuum is filled by turbulent air, giving a large increase in drag. A sharp lip also ruins any hope of maintaining laminar flow, but it reduces further loss by shedding the air flow and reducing the area the suction is working on. This is why the half sphere in the chart above has less drag than a whole sphere, and is also the same principle at work with the dimples that promote turbulence and detach the air flow on a golf ball, instead of letting it cling for another quarter of an inch. 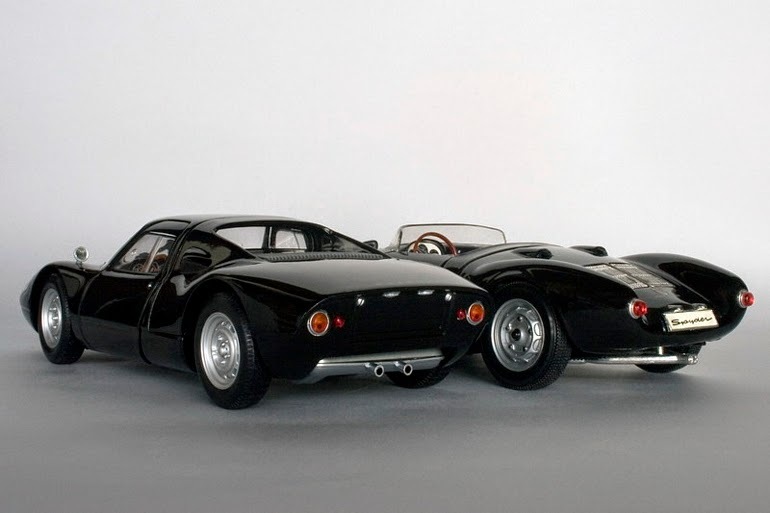 Left- newer Porsche 904 Kammback tail, right- older 550 Spyder classic teardrop tail. A front bike fairing reduces drag by spreading the air flow apart in a laminar fashion over an area large enough to fit the rider in behind, but it can also reduce air drag further by cleanly shedding it's own air flow. Often times lips are added to the top of a windscreen to aim the air flow above the rider for increased comfort, but adding something to the sides can be just as important for cleanly shedding the airflow. This can be a small curve or lip, an extra thick section, or even molding glued on. It is also possible to have secondary vents that feed controlled air to behind the fairing to reduce the strength of the vacuum, (air bleed ports have been tested on the trailing section of airplane wings for reducing drag and found to work, but the air supply system was too complex to be practical). Notice the very unaerodynamic tail with the battery box stuck out on a frame. Speed vs power for the two fairings shown above on Kraig's electric motorcycle. 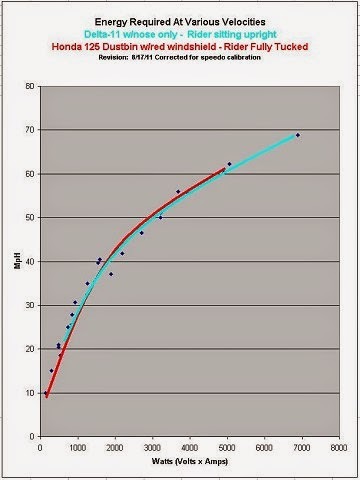 Red line is 2009 Dustbin fairing, Blue is 2011 upright riding position fairing. 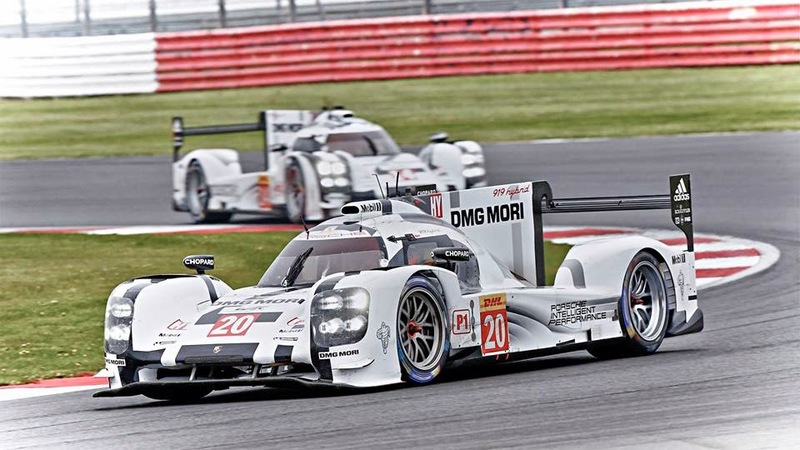 Despite the 2011 tail having much more drag, the power use is similar. Tails in turbulent air matter much less than front fairings. One other consideration with fairings is the location of the Center of Pressure from the side. 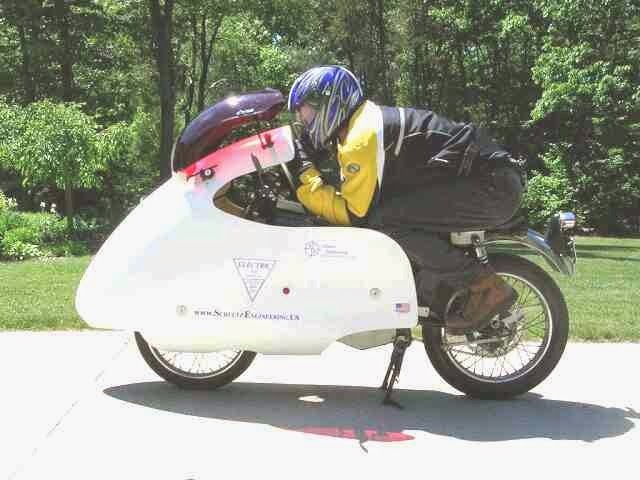 The crosswind force on a fairing can be summed up and represented as a push on the side of the bike in one spot. In a similar manner the weight of the bike can be summed to find a Center of Gravity (or Mass), and the tire traction and wheelbase also affect turning dynamics around a central point. If the Center of Pressure is near the Center of Gravity or the central turning point, it won't affect handling much when a stiff crosswind hits. However if the Center of Pressure is a distance in front of the other Centers, it will steer the bike in the wrong direction (with the wind), and if the Center of Pressure is behind the others, it will be self correcting and steer the bike into the wind. This can be interpreted as either making the front fairing small to reduce it's effects, or including a rear fairing in the plans. Note- this is a separate issue from mounting the fairing on the handlebars (instead of the frame), which is even worse than a forward Center of Pressure, because a crosswind will then directly steer the handlebars. For a car with 160 hp (120,000 watts), this amount of energy doesn't matter, but for bike with 200 watts it does. It is possible to gain a total of 60-70 watts from being careful with airflow while still keeping a more upright riding position. or multiply by 100-200 watts for a slower commuter. With a generic Cd reduction of 0.7 for a front sphere, and 0.35 for a rear tail, is it worth trying to come up with a practical bike tail shape? 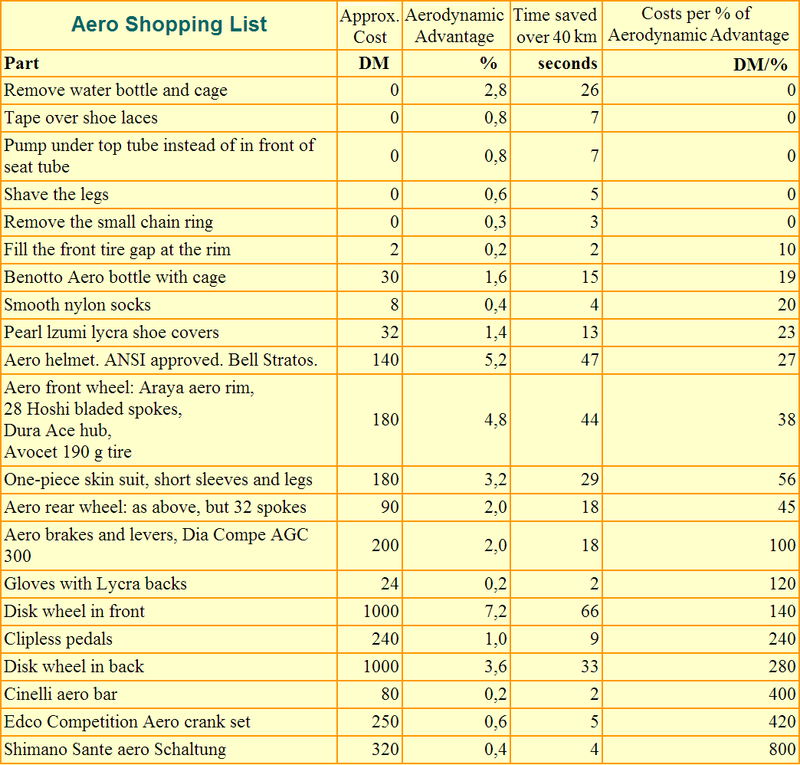 With a more enclosing bodywork, most of the items in the above chart don't matter, (I can wear street clothes), and the performance takes a large step up. 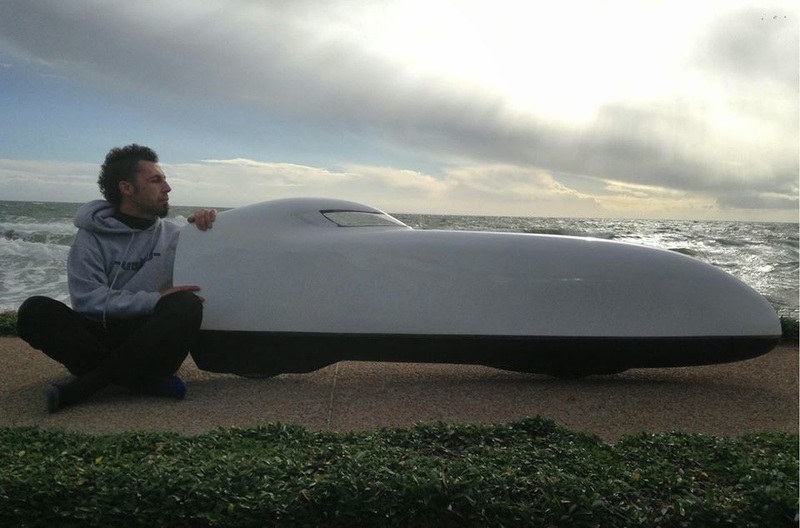 The human speed record enclosed bikes are traveling at 80 mph, and I've read several reports from velomobile riders of commuting in the 30 to 40 mph range (using human power only). Weather wouldn't matter very much either. But it would be difficult to ride through mud, or to do frequent stops and starts. 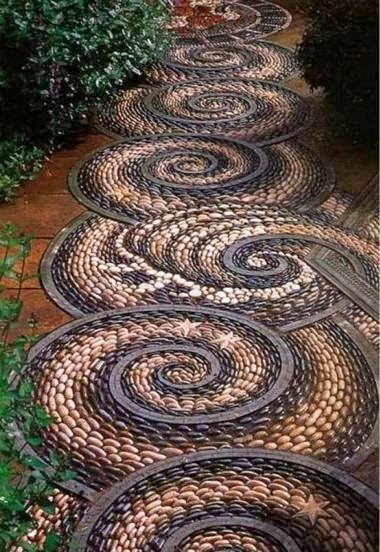 It would not be as well suited for Vermont roads and I couldn't put my feet down, I would probably have to get out and push it along occasionally. Would a practical body shape maintain laminar flow all the way to the tail? most of the three wheel velomobiles are about twice this size. This seems like the most productive way to go for a street errands bike. 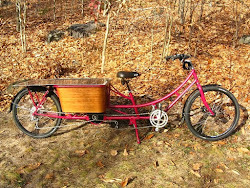 Maybe aerodynamic panniers that divert the cold winter air? In many respects this plan is very similar to town energy committee goals for buildings- first reduce the energy needed (i.e. conservation- by a smaller house or less vehicle frontal area), second make the energy you do use more efficient (a better heating system or vehicle aerodynamics), and then third add renewable energy. 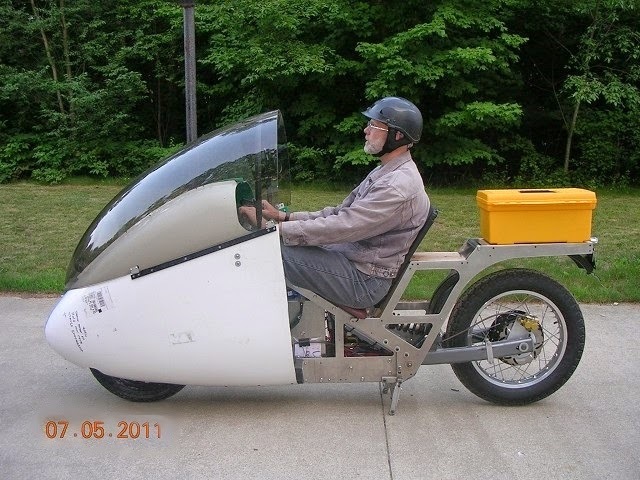 The next post in this aero series will look at taxifiets, the ELF, velomobiles, bubbles, some German project bikes, and other things on the road.